After this dinner we wandered around the Farmer’s Market and the Grove, and I decided to check out the Cost Plus World Market. My previous post on champagne had elicited A LOT of positive reviews of Cost Plus on Yelp! and there was one a mere two-minute walk from Monsieur Marcel. I have to say I was pretty impressed. Many different wines, many for a few dollars less than at your more frou-frou wine stores. In terms of Spainish wine, for instance, you can find a Conde de Valdemar Riserva for $14.99, and Marqués de Riscal for $12.99. Will and I were looking around and a young woman says something indistinct to me. I turn around, and she says, “Oh, I’m sorry, I thought you worked here!” (a comment I get quite often at different sorts of stores–the Gap, Banana Republic, Jiffy Lube). A few more words exchanged showed that she was looking for a malbec. I LOVE MALBEC! This woman and I searched the wine section and found the Argentine wine shelf–they had a few malbecs. 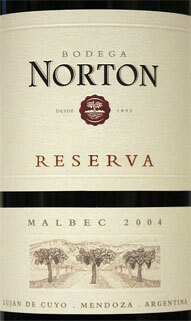 Then my eyes settled on the malbec reserva from Bodega Norton, priced at around $12-14. Then, below that the “regular” malbec from Bodega Norton for the bargain price of $7.99! I had come across Bodega Norton frequently in magazines and online reviews. This estate was established in 1895 by an English engineer, making it the first winery in the now-famous Mendoza region of Argentina. I related this to the woman, who picked up a bottle. She either was won over by this information or was just tired of my going on and on about wine! Whatever the case may be, I decided to pick up a bottle for myself–tasting notes will follow soon! ← The End of Smoking in France?